The story of Thomas Dunn, whose life — and death — brought together a community in love and unity, propelled the Tom Donovan Arena in Renous to win the title of Kraft Hockeyville 2019 on Saturday night. The fourteen-year old son of Dawn and Harry, and brother to Aaron, passed away accidentally in June. As winner of the annual competition, the thirty-five year old Tom Donovan Arena receives a cash prize of $250,000 as well as the opportunity to host an NHL pre-season game. The three runner-up communities of Rich Valley, Alberta; Saint-Polycarpe, Quebec and Wilkie, Saskatchewan will receive $25,000 each for arena upgrades. This marks a first time win for the province of New Brunswick in the competition’s 14 year history. 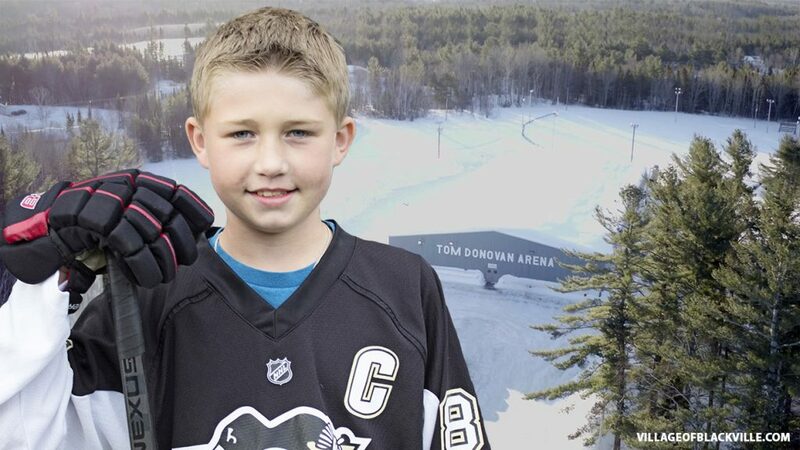 The organizing committee for the local bid was formed in January in memory of Dunn, the young athlete from Keenans, and included members of his family, as well as family members of the arena’s namesake, Tom Donovan. An outpouring of support quickly grew, especially after the announcement that the arena made the Top 4. Hundreds, if not thousands, of businesses and organizations all over the province of New Brunswick began setting up window displays, posters and signs marked with Dunn’s signature T6 memorial logo and NeverDunn hashtag. Communities all across New Brunswick and Canada rallied their support. Backing also came from NHL players Jake Allen of the St. Louis Blues, Brad Marchand of the Boston Bruins and Brad Malone of the Edmonton Oilers. Online voting opened on Friday, March 29 and lasted for thirty-two-and-a-half hours. Local businesses offered free wifi and kiosks for voters. Blackville School and the Renous Recreation Centre opened hubs for the total duration of the voting period. After a series of tragic deaths in Blackville and surrounding areas in the past year and a half, a win for the arena in Renous shines a much needed light on the grieving community. Thomas Dunn not only lives on in the lives of the six people his organs gave a second chance to, or the two people he gave the gift of sight to — but his legacy now lives on in the arena he spent much of his life in; an arena that will endure for generations thanks to his story that touched the nation and led to the Kraft Hockeyville win. The win, announced at about 11:45pm on Saturday night, marks a fitting tribute to Dunn, who would have turned fifteen years old just fifteen minutes later. Thomas’ mother Dawn always told him when he hit the ice to “make them remember your name”… he certainly has. For information on how to become an Organ Donor, contact Service New Brunswick at 1 (888) 762-8600. For information about Organ Donation, contact the New Brunswick Organ Donation Program at (506) 643-6848. For information about Tissue Donation, contact the New Brunswick Eye and Tissue Bank at (506) 632-5541.